Smartphones are becoming fancier, more popular, and more expensive, and that is why they are increasingly liable to theft. Now in case if you lost your Android device or theft you’d do well to find out how to ensure that your phone finds its way back to you or at least, how you can make it difficult for thieves to get anything out of it. Now here in this How to Guide we’ll discuss How you can easily protect android phone from theft and ensuring that your device can be easily tracked and find a way back to you. This is a How to Guide for both Rooted and Non-Rooted Android Device. First we’ll discuss the Two popular Anti-Theft Apps – ADM (Android Device Manager and Theftie, and then follow guide on How to secure your Device with the Help of Video Tutorial at the End of the Post. So, as owners of a phone that came with this service pre-installed, we should be free of worry when it comes to losing our devices, right? A would-be thief could easily circumvent Device Manager by simply enabling airplane mode or turning off your phone. This would prevent the Device Manager service from connecting to the internet to upload its location data. Even with lock screen security enabled, these features can still be accessed. Theftie is an app which can easily lock, locate, track, rescue data on your lost/stolen phone or misplaced Android, and takes thief’s selfie when suspects. One great feature of Theftie is its ability to send your data to your Google Drive in case you lost your phone. And it’s free on Google Play Store. It works in three way process – Prevent, Catch and Rescue. Prevent: Detect unauthorized access to phone and immediately lock down the device, capture a theftie and send to your email. Catch: Get thefties and locate your device in realtime. Make it easy to communicate with the person who holds the device. Rescue data: Retrieve your texts, photos or documents from the lost device right on your Google Drive. Rescue data: upload apps/folders to your Google Drive in case you lost your device. Now this is the feature that i was talking about at the startin of this Guide, this app also helps you in making your device Factory Reset proof which means only you can Reset your device even remotely. So now the Question is that which of the two apps you should install to Protect your Android phone from theft? Answer is Theftie (Without root access) and Theftie and ADM both(with root access). Yes, Non-rooted device still can be formatted using various modes like Bootloader Mode, Recovery Mode, Via ADB etc. But if you have a Rooted android device then you are good to go. Now i assume that you have root access, you can follow these simple steps, thoroughly, and you can be sure that a potential Nexus or Android thief would end up having to wait on your battery to die or for the police to arrive. Before getting ahead of ourselves, we’ll need to ensure that Android Device Manager has all the permissions that it needs to function properly. First up, head to your phone’s Settings and tap Location. In here, tap Mode at the top, then select High Accuracy (if it is not already selected). Next, tap Google Location Reporting at the bottom of this menu, then hit Location Reporting on the next screen. See to it that this toggle is set to On. If you haven’t already set up lock screen security, now is the time to do so. Not only could a potential thief have direct access to all of the data on your device without this, but they could easily disable Android Device Manager altogether if you leave your phone unsecured in this way. From your phone’s Settings app again, tap Security. Hit the first entry, titled Screen Lock. In here, choose from Pattern, Pin, or Password to set up a screen lock. For this tutorial, I’ll demonstrate using the PATTERN method. You’ll be asked to enter your new lock screen Pattern, Pin, or Password here. When you’ve done that, tap OK, and you’ll have to enter it again once more. To finalize this setting, hit Confirm. Next, scroll down and tap Device Administrators. The box next to Android Device Manager should already be ticked, but if not, tick it and hit Activate. Now that you have lock screen security enabled and you’ve given Android Device Manager all of the permissions it needs, you should now make sure that a potential thief can’t simply enable airplane mode or turn your phone off to circumvent your security measures. Thanks to a recent addition to the Advanced Power Menu Xposed module, this last loophole can be closed. The app’s developer, kennethso168, has added an option to disable these power menu entries on the lock screen. From the Xposed Installer app, head into the Download section and search Advanced Power Menu. Tap the top result, then swipe over to the Versions tab and hit Download. You can also install the app directly from here. This will launch the installer, where you should hit Install. When that’s finished, you’ll see a new notification. Tap the Activate and reboot button here. Once you’re back up, open the newly-installed Advanced Power Menu app. Right up top are the options we’re concerned with today. This interface provides other options for customizing your power menu. First up, tick the box next to Anti-theft helper. This will open up three more options. Tick Hide ATH description and Remove volume state toggle here. Fake power off doesn’t seem to work, so leave it unticked. At this point, your phone is now as secure as it can be—even in a thief’s hands. A would-be thief can’t unlock your phone due to the lock screen security you’ve added. 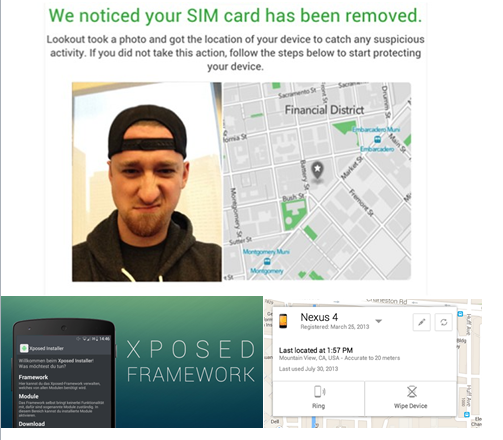 He (or she) can’t even turn the phone off or put it in airplane mode to circumvent Android Device Manager. And speaking of Device manager, you now know that it’ll function properly when called upon. To locate, lock, or even wipe your phone, you can simply visit this link from any web browser (that’s a good one to have in your bookmarks). There’s even an Android app that you can use to access this service from a different Android device, which is available on Google Play. Doesn’t that give you a little peace of mind? Which secure lock screen did you choose? Let us know in the comments section below. Just wanted to let you know that we’ve launched YouTube Channel where we upload awesome video content. Make sure you hit the subscribe button to stay up to date with the new videos we upload every week. i have recently lost my MOTO G2, although there wasn’t thefti app installed in it , andeven no sceen lock , my phone was configured with my gmial id [email protected] . Is there any way my phone can my located through my gmail acount . Sorry to hear that. But yes, you can use Email ID to locate your device if Android Device Manager was pre-installed or by you. Second way could be, using your Email ID for tracking device using “Android Lost App” which you can install on your device remotely if your device still has any access to internet. This is complicated but works. You must know that you can install any app on your device remotely using Play Store. Go to PlayStore via Desktop or Laptop, Login using Same Email ID you mentioned. Search “Android Lost App” or “Android Device Manager app” and click install button. The installtion is simple and straight and only thing required is that your phone is still connected with your Google account. As this could be a case of theft, so just hope that the thief doesn’t disconnect from your Account. Hi There, commendable information for Smartphone protection. Just one doubt. Does the rooting breaks the warranty specifically for Xiaomi Redmi Note 4 and Lenovo K6 Power ? If so do we have any alternative option to stop thieves from reinstalling​ device or flashing and changing IMEI ? Rooting does voids warranty. And Android phones like Xioami’s and many others are not secure enough like iOS devices.